Akihiro Nikkaku (left), president of Japan's Toray Industries, appears at a news conference Tuesday in Tokyo. He said instances of falsified quality-assurance data did not compromise product safety. The company said in a statement that its Toray Hybrid Cord unit "has inappropriately overwritten data that was provided in inspection reports to customers." The customers affected weren't named, but the company said later that the deception didn't involve materials supplied to Boeing. Toray provides the U.S. aircraft manufacturer with lightweight carbon-fiber components. 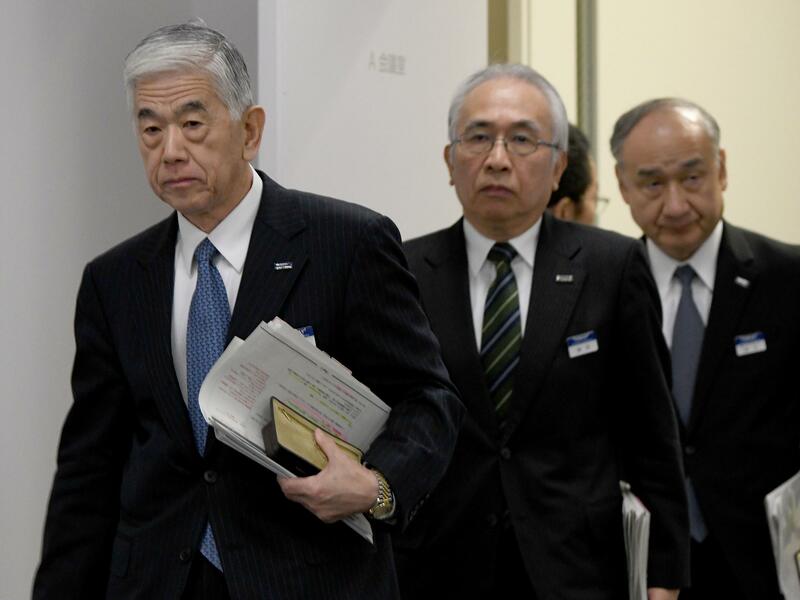 "There were no legal violations or safety problems; this was between us and our customers, and so there was no need to disclose it," Toray President Akihiro Nikkaku told a news conference, according to Reuters. The company apologized "for all concern and inconveniences caused" and said it is investigating all of its operations. The disclosure at Toray follows recent revelations about quality-control deception at other high-profile Japanese industrial companies. In October, Kobe Steel announced that "data in inspection certificates had been improperly rewritten" for some of its aluminum and copper products that failed to comply with specifications. Mitsubishi Materials said last week that some of its products "deviated from customer standards or internal company specifications due to misconduct, including the rewriting of inspection records data." And, The New York Times reports, "Nissan and Subaru acknowledged last month that they had been allowing workers who lacked certifications required by Japanese regulators to inspect vehicles produced for the Japanese market." The problem comes as Japanese companies "face pressure to meet sky-high quality specifications and unrealistic internal profit targets," the Financial Times says.